Titusville, Florida – Largemouth bass usually aren’t orange, but in rare cases an angler will find something truly incredible on the end of a fishing line. 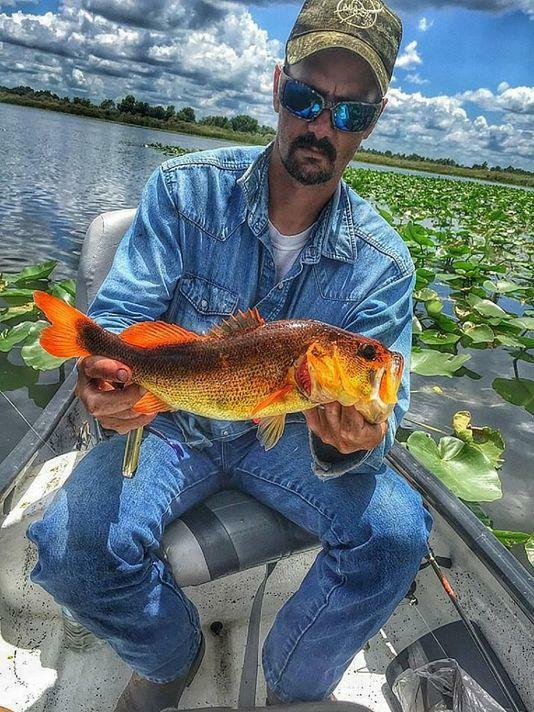 Pugar Gheen was fishing at Fox Lake in Titusville, Florida this summer when he caught a largemouth bass that stood out from the rest. This fish has an extremely rare genetic anomaly called xanthism. Xanthism causes the pigments in some animals to turn orange, similar to the way albinism causes a lack of pigment. To put its rarity into perspective, the FWC has sampled 255,632 largemouth bass from 175 different water bodies over a 10-year period and have no reported sightings of this genetic phenomenon. In fact, the only sighting that the FWC freshwater fisheries researchers have of these orange bass is one photo from an electrofishing trip nearly 30 years ago!